By veterinarian Dr. Fiona for Pets Best, a U.S. dog and cat pet health insurance agency since 2005. 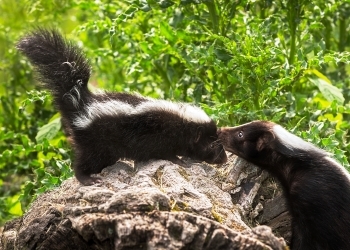 A skunk’s spray is a scent you’ll never forget. And when the skunk’s target is your pet, it can be particularly offensive. You’ve probably heard of the old tomato juice trick, but in actuality this is unlikely to do more than just mask the smell. Why Does Skunk Spray Smell So Awful? To answer this question we need to go back to chemistry class. A skunk’s defensive spray is composed of a handful of chemical components. One specific group called thiols is the main culprit of the malodorous smell. In skunk spray, there are three thiols that compose anywhere from 50% to 80% of the spray. No wonder the smell is so difficult to remove! Another component of skunk spray is called thioacetate. This compound isn’t as stinky as the thiols mentioned above, but is converted into a more fetid smelling thiol when exposed to water. This explains why washing a pet after being sprayed by a skunk doesn’t eliminate the odor. To eliminate the smell from thiols and thioacetates, a chemical reaction has to take place. These chemicals have to be oxidized, which means adding oxygen atoms to the compound to convert it to sulfonic acid. This is achieved through oxidizing agents such as bleach or a more mild and pet friendly option, diluted hydrogen peroxide. Once oxidized, the weak sulfonic acid is broken down in water from washing and you’re left with a clean smelling pet! Keep in mind that the ‘liquid’ in skunk spray is not only offensive to your nostrils, it can actually be dangerous. Skunk toxicosis can occur if the dog ingests some of it, causing potentially life-threatening anemia. In addition, the spray can be caustic and can cause irritation and damage to the lungs, corneas and other delicate parts of the face in both cats and dogs. Respiratory illnesses and dermatitis can occur with skunk spray as well. If your dog or cat has been sprayed by a skunk they may need veterinary attention. Speak to your veterinarian to determine if a visit to the ER is in order. Make sure to monitor them carefully over the next few days to ensure respiratory or eye irritation doesn’t occur, as well as anorexia, vomiting or not feeling well. Pet insurance plans like our BestBenefit plan includes coverage for injuries and accidents, even those related to a skunk incident. Do not mix these ingredients in a closed bottle. Baking soda and peroxide together will explode! Also, avoid contact with your pet’s eyes as the solution can cause irritation. Baking soda will buffer and further reduce the the already diluted hydrogen peroxide’s concentration. It will also provide odor eliminating properties. Lather and bathe several times with the solution. Rinse well in between washes. The hydrogen peroxide and baking soda will begin to oxidize the thiols in the skunk spray. The washing and rinsing will dilute and remove the resulting sulfonic acid. One consequence of oxidizing agents like hydrogen peroxide is that it may change or “bleach” pets fur color. While terms like “acid” and “oxidize” may sound terrifying, especially when your fur baby is involved, this method is completely pet safe and is recommended by the Humane Society of the United States. The concentrations of these ingredients is very low, making them safe to use. These ingredients are often used as gentle green alternatives to traditional home cleaning products. Avoid your pet’s eyes, nose, and mouth like you would during any other bath and they will come out smelling like roses or at least less like a skunk! There are over the counter skunk products available as well, such as Nature’s Miracle Skunk Odor remover and Skunk Off made by Thornell. Skunk shampoos are also available and should work better than tomato juice. Parting tip: Keep your dogs on a leash to help avoid any potential skunk run-ins.